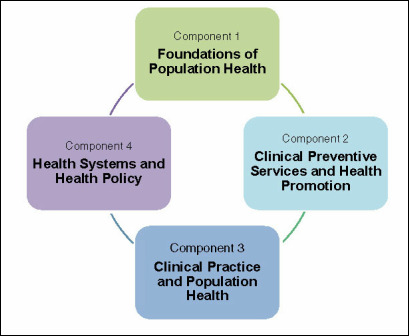 The Clinical Prevention and Population Health Curriculum Framework provides a common core of knowledge for clinical health professions about individual and population‐oriented prevention and health promotion efforts. The Framework can support interprofessional prevention education and practice. The Framework consists of four (4) components and 23 domains, with each domain including topic areas and illustrative examples. Quantitative and analytic skills used to assess, compare, describe, and monitor the health of populations. Evidence-based, health promotion and disease prevention interventions in the clinical setting. Opportunities and disciplines that require individual- and population-based health perspectives. Systems and policies that help to govern the health and healthcare system, including collaborations between the clinical care and public health communities.